I remember when plasma globes were special enough that they were exhibits at science museums. That I could incorporate one into one of my creations was too cool. If you google “plasma globe”, you’ll come up with all sorts of hits. I did it too, and now own several, ranging from 12 inches in diameter down to a battery-powered 3-inch one. But they were all larger than the one that I had seen in the electric guitar. Some deep diving on Amazon finally yielded this one, which is made to be powered by the lighter socket in a car, and which unfortunately is no longer available. However, a similar globe, made by the same company, is available. Designing a pistol that incorporated the globe was pretty straightforward; the execution was more troublesome. I envisioned replacing the cylinder of a revolver with the globe, and realized that if I started off with a plastic Nerf-style gun, it would require a lot of cutting and filling to fit the globe. So I decide to start from scratch and make the grip and body of the gun from wood and the barrel from brass. I made a cage of copper wire around the globe to protect it. A lot of cutting, drilling, shaping, and sanding of the wood was required to hollow out the space for the globe, and shape the grip. Did it end up being more or less work than if I had started with a plastic pistol? I’m not sure, but I’m more comfortable working with wood, so it was less daunting. In order to prepare the globe for use, I had to disassemble it–very carefully because the globe itself is glass. I extracted the globe from the electronics and added an on/off switch in the trigger position. The circuitry that creates the plasma is meant to be powered by 12V DC auto supply, but the manufacturer kindly included a “Try Me” feature in the packaging where the globe can be powered by a number of coin cells. I incorporated that power supply in the pistol and the cells are still working several years later. The circuit board and coin cell assembly are inside the grip of the pistol. The barrel is part of a brass candlestick with another twisted brass tube soldered beneath it (actually part of a Victorian gas lamp). The hammer is a brass finial, and there’s also a brass filligree applique on both sides. I finished the wood in a rich red mahogany color. The grip is wrapped with soft black leather, which should make it fairly painless to replace the coin cells when needed. 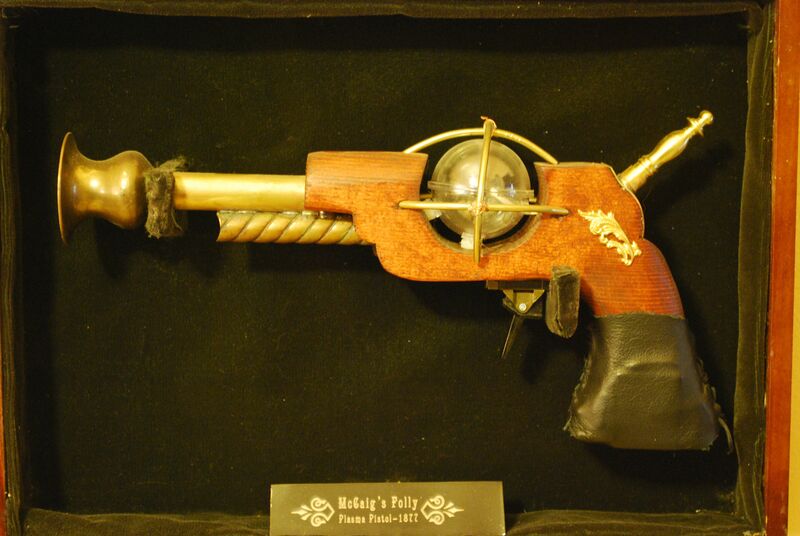 The photo shows the pistol hanging in its display box (a modified silverware box found at the thrift store). 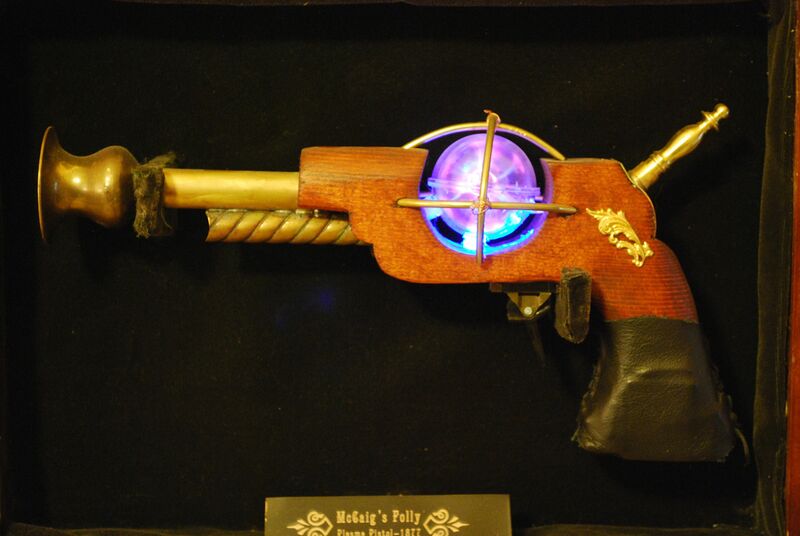 The pistol’s name is “McCaig’s Folly” which requires some explanation. In Oban, Scotland, there’s a incomplete monument called, “McCaig’s Folly” (or McCaig’s Tower, but where’s the fun in that?). My wife’s maiden name is also McCaig (no relation to the Victorian monument builder as far as we know) and it turns out that she worked on plasma mass spectrometry in grad school. So it all fit together. The pistol activated, ready to fire. The next morning, Boffin rose and re-packed his haversack. Into it, he placed one item that he had not previously packed: a strange looking handgun. It was longer than a revolver with a barrel that flared at the end to a bell. In place of the cylinder was a clear glass sphere surrounded by copper rods. A small switch was positioned on the right side of the grip right behind the trigger. He shoved the pistol into its holster and placed it last into the haversack. Boffin took out his pistol, and closed the small knife switch on the side. The glass globe started glowing. Boffin couldn’t hear the sound of the pistol charging over the noise of the wind and rails, but he could feel it through the grip. He took aim at the next pole and squeezed the trigger. A glowing ring of light shot out of the muzzle of the gun and the entire assembly— wires, insulators, crossbars—shattered. Boffin reholstered the pistol, but kept it energized. “I guess that took care of it,” said Franklin. One of the defining characteristics of steampunk culture is the ability to imagine and create our own artifacts from the past that never was. 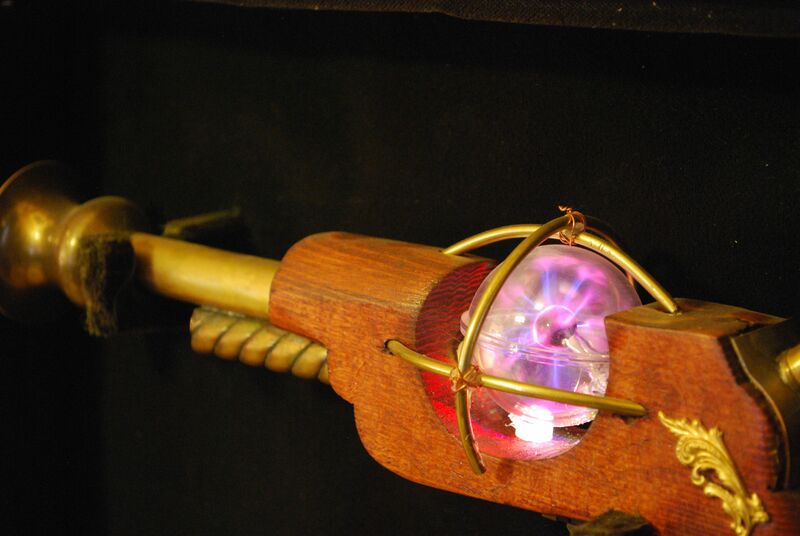 What steampunk accessories or gadgets have you made?